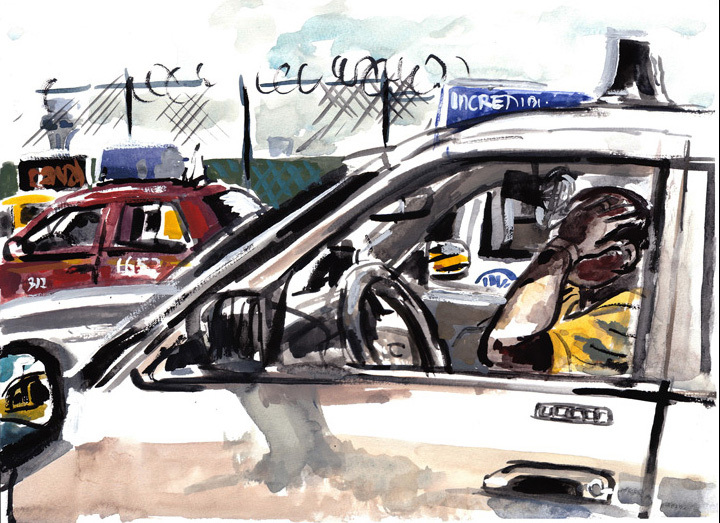 After eighteen years of tending bar and driving a cab, Dmitry Samarov is finally receiving the attention he deserves, thanks to “Hack: Stories from a Chicago Cab,” published by the University of Chicago Press. Two non-gallery shows popped up last month, featuring his sports- and music-related illustrations and some nearly abstract paintings of tumultuous bookshelves. Now, Lloyd Dobler Gallery has brought together a few of his Hack stories along with the original artwork that accompanied them. But unlike Samarov’s spot-on observations of humanity, all of these exhibitions miss the real story, namely that Dmitry Samarov is an exceptional painter, especially of cityscapes and interior views. The two ink and wash drawings are the only evidence at Lloyd Dobler of the adept, inventive and inspirational work in many media that can be found on the artist’s websites. And that work has been getting more free and joyous, but no less tightly designed, in the two decades since he studied at the School of the Art Institute of Chicago (1990-93) where, he says, “I definitely felt like a second-class citizen trying to paint perceptually, but I wasn’t alone and was always comforted by the certainty that what I was attempting was connected to what people have been doing since cave-paintings.” Which is not to say that he was entirely self-taught. “My main teacher was Dan Gustin, and others who were generous and helpful,” like Mark Pascale, who introduced him to the wonders of the Art Institute’s prints and drawings collection, which might account for his voracious appetite for design. Just like his cab on a bleak winter night, Samarov’s compositions cleverly negotiate the maze of urban clutter. Indeed, he seems to revel in giving himself nearly impossible problems to resolve, breaking up the page with window panes, telephone poles, irrational blobs of intense urban color and side-streets going nowhere. In the end, it’s all about the joy of color and space, and the endless possibilities of living, with the same realistic but positive attitude also evident in his stories. What’s really needed is a big space, like the galleries of the Cultural Center, where the actual paint and paper of his larger works can be seen in all their sensual glory. Through November 19 at Lloyd Dobler Gallery, 1545 West Division, second floor.